My obsession with Sanrio doesn’t stop at my Hello Kitty Cakes. In fact, Hello Kitty isn’t my favorite Sanrio character. I’m a big fan of Badtz-Maru…partly because we’re both born in April but there’s more. Over the years I’ve watched Badtz-Maru go through a couple of cycles. He likes to travel, loves space, into chemistry, plays guitar, plays bass guitar, runs around in a crown and cape, and dreams of greatness. These are things that I’ve been doing for most of my life too. In fact, I’ll visit a Sanrio store just to see what’s he’s doing to see if we’re still in sync. I’ve been tempted to buy the Badtz-Maru bass guitar that they sell in the stores but it’s a little short for me. 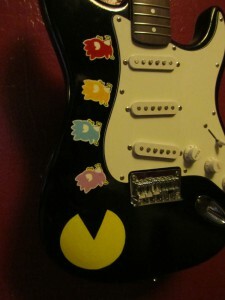 Instead, I decided to build a custom guitar of my own. I’ve had a Squire Bullet for a couple years that has been collecting dust and I figured it was about time to put it to some good use. 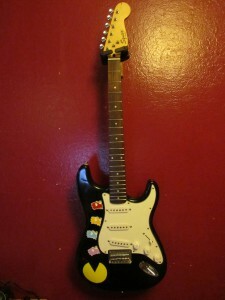 I haven’t decided on the electronics yet but when I do, I’ll feature this guitar in my music section. For now, it’s a glorified art project. Squire Bullets are famous for people buying them and then changing the electronics. Taking a $99 guitar and making it a $500 guitar. For a little history, the bullets before 2007 were made from plywood and the ones after 2007 are solid basswood. The one I modified is pre 2007. 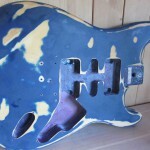 Sanding down the original finish took a while. 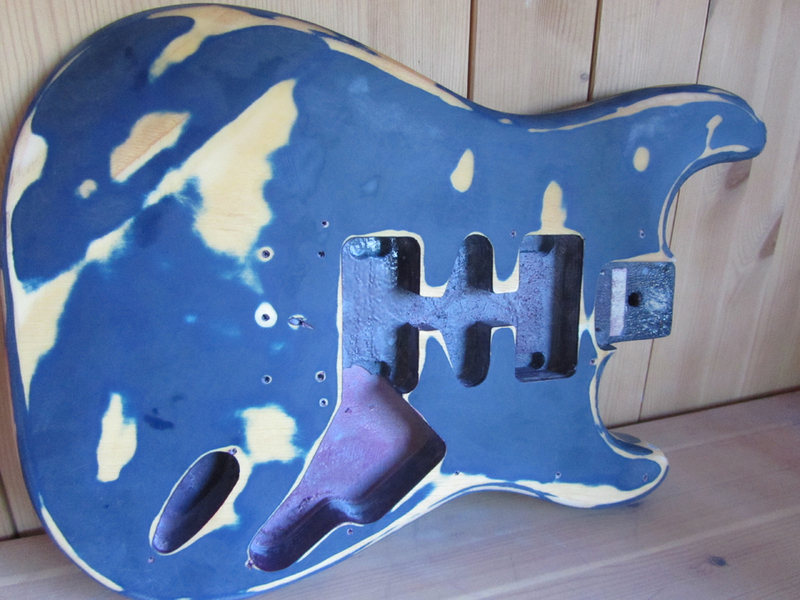 I wasn’t aware of the thick coat of clear coat. Removing the clear coat took a while. 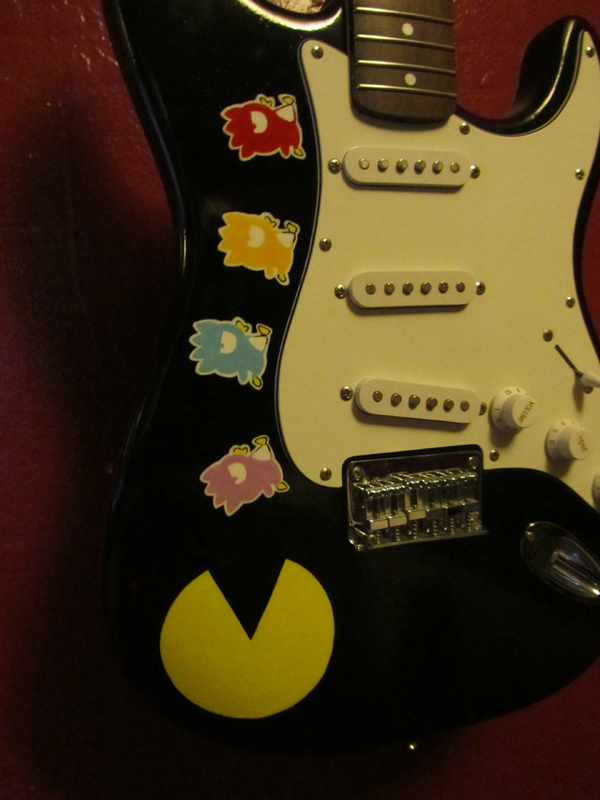 Guitars are almost like artists’ canvass. After sanding, I used 80, 100, 160, 220 grit, I put on a layer of black and left it like that for a few days because I didn’t have a bigger plan. I ended up commissioning my brother-in-law to help me out with design. After a few hours of brainstorming, we came up with the design below. He went for it and I clear coated it. The next step is to setup new electronics. My plan is to throw in some Dimarzio pickups. Stay tuned.